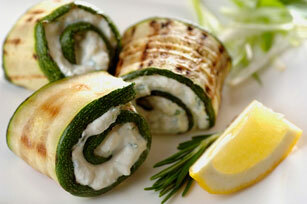 A blend of cream cheese, feta and seasonings makes a tasty spread for grilled zucchini slices. Roll 'em up and prepare to wow the crowd. Spice up your mealtime with these easy-to-make roll-ups. Serve with your favourite fresh fruit to round out the meal. Add 1 tsp. lemon zest and 1 Tbsp. lemon juice to cream cheese mixture before spreading onto grilled zucchini slices.